The exhibition features art that illustrates how visions are achieved, from meditation, to drumming and dancing, to ingesting sacred plants. An exhibition on ancient art and its traditions in the Central America region will be presented by the Michael C. Carlos Museum from Sept. 8 through Jan. 5. "'For I am the Black Jaguar': Shamanic Visionary Experience in Ancient American Art” will feature works showcasing major elements of trance consciousness. 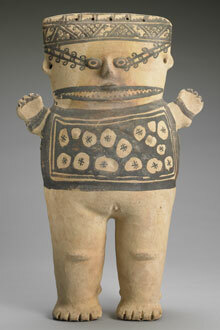 Quotes from practicing shamans will accompany many of ancient object displays. Rebecca Stone, faculty curator of the Art of the Americas at the Carlos Museum, will lead visitors through the exhibition on Sept. 13 at 7:30 p.m.
A series of related talks illuminates the traditions that influenced the works covering indigenous and colonial roots of magical imagery; images on textiles; psychedelics; women’s roles; and more. For more information, visit carlos.emory.edu/black-jaguar.